Editor’s note: WTIA, a Code Fellows partner, recently held their annual Downtown Seattle Tech Crawl. Nicole Newland, WTIA Program Manager, shared that this year the tech crawl “added in more stops and allowed our attendees much more independence and freedom by implementing a ‘choose your own adventure’-type feel,” creating another successful networking opportunity for software developers in Seattle. Our Career Development curriculum heavily encourages and trains students to network, as 70-80% of job openings are never published. 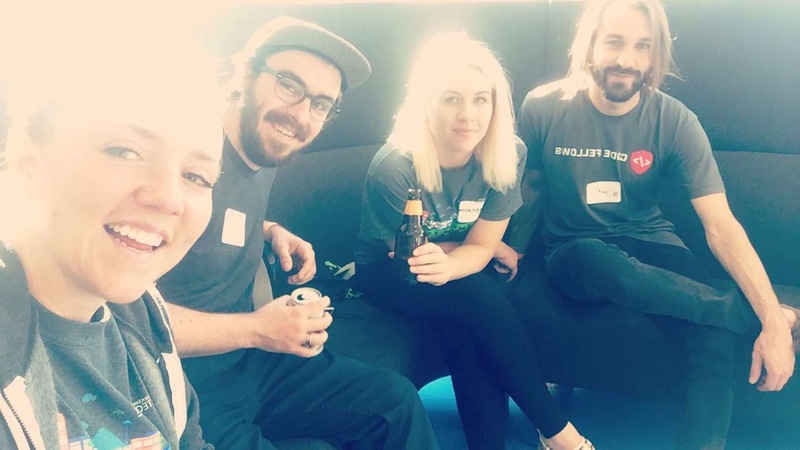 Izzy Baer, a current Code Fellows student, came away from the event with several insights to share with other developers new to Seattle’s tech scene. Below, she shares 10 things developers should do before, during and after any networking event. A few weeks ago, I attended WTIA’s 2017 Tech Crawl, where local tech companies open their doors and let job seekers check out their offices, learn about open positions, and shmooze with the hiring managers and recruiters. It’s a great chance for devs to learn about new companies and get a bigger glimpse into company culture, and helps tech companies attract developers. The most meaningful part of the event was the opportunity to network with other female developers in the tech industry. I spoke with a few female software engineers who were happy to share their experiences and what a day in the life of a developer looks like, from a female’s perspective. It was really special to connect with them and converse about advocating for women in the tech industry. Because I was able to get so much out of this event, I wanted to share 10 pointers for other devs who are starting out in the industry (and who may be a little hesitant when it comes to networking events). The most interesting thing I learned from participating was that there are far more tech involved companies and opportunities available for software developers than I had ever imagined, or known. There is no shortage of jobs in Seattle for devs and the tech crawl made that very apparent and real. Go to the event. Even if you don’t want to or don’t think it matters, it does, so just go. Trust me. Walk up to people and introduce yourself, shake their hand, and connect with them. Ask them thought-provoking questions, and tell them about yourself. Stand out. You are unique—show them! Get their business card and connect with them on LinkedIn after the event. I made connections with several people after the event on LinkedIn that I’m still casually chatting with now, a few weeks later. Send them a message or an email and tell them how great it was to chat with them, and thank them for their time. People want to be connected with on a personal level, not just “can you get me a job?” Make it personal so that if you need their help down the road they’ll be more inclined to give it. Post about the event on several social media platforms, and tag the businesses, companies, and people. Approach these types of events with an open mind, and let your perseverance and curiosity shine. It will radiate from your face and people will be drawn to you, and—more importantly—remember you. You never know what could happen, who you could meet, or what kind of opportunity being outgoing, curious and friendly will provide for you. These events could easily land you an awesome job or new connections if you take advantage of them. If you don’t go and see what’s available to you, you’re not giving yourself the best chance of success that you deserve to have. Be an advocate for yourself—you’re a software developer and you’re the future. Use these 10 tips and you’ll make great strides in building your network and—if you’re looking for your next opportunity—landing a new job. Good luck!